Earlier this month, the Oregon Department of Energy announced that we're accepting applications for the latest round of Renewable Energy Development Grants. We have approximately $2.75 million available for projects that generate renewable electrical energy from resources such as wind, solar, biomass, geothermal, hydro, biogas, or wave/tidal/ocean thermal. Like our last round of grant funding, we are offering a two-tier system for the competitive grants so that similarly-sized projects compete together. We'll allocate about $1.5 million in RED Grant funds to projects sized up to 300 kilowatts (AC). Another $1.25 million will be allocated to projects greater than 300 kilowatts (AC). This is the eighth round of our RED Grant program, which received a national State Leadership in Clean Energy Award last year from the Clean Energy States Alliance. Previous RED Grant awardees include Oregon businesses, agricultural producers, manufacturers, public entities, and nonprofit agencies – with projects ranging from solar arrays to hydropower systems to biogas facilities. Applications are due by April 22, 2019 and will be checked for completeness before going through a competitively-scored review. We expect to begin notifying potential recipients this summer, and funding is awarded upon completion of the project. A full opportunity announcement and application materials are available on ODOE’s website. And check out previous RED Grant awardees, including the City of Salem, Coyote Trails School of Nature, and Bend Area Habitat for Humanity. 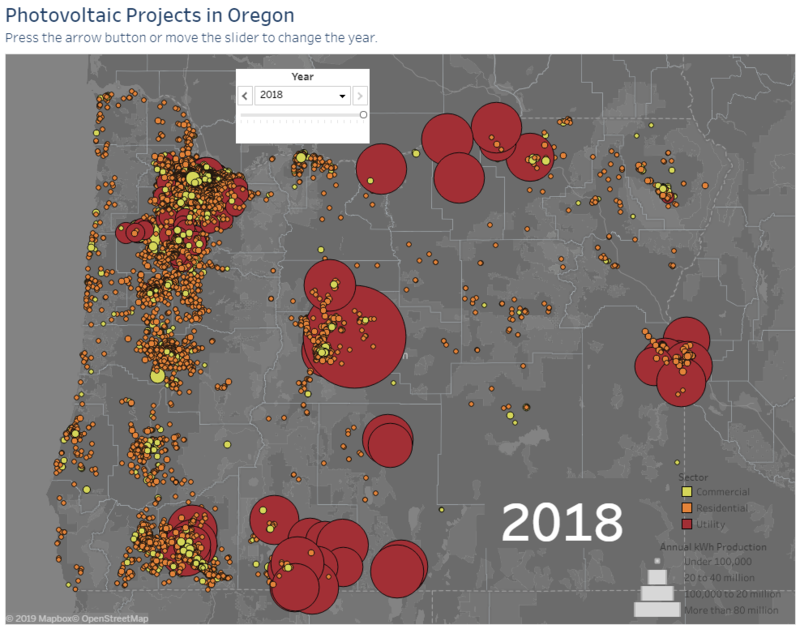 Visualizing the rise in Oregon's renewable solar electricity is easier than ever thanks to a new Oregon Solar Dashboard. The Oregon Department of Energy developed the dashboard with partners across the state, and we were thrilled to include data from many Oregon utilities and organizations. We recently provided a sneak peak of the dashboard to utility managers and asked for feedback to help make it better. Thanks to everyone who offered suggestions. The dashboard is now live on our website, but we'd still love to hear your ideas and comments as we implement the great feedback we've received to make it more useful. Our latest episode of Grounded features Matt Teske, founder and CEO of Chargeway, an Oregon-based company dedicated to helping EV drivers more easily charge their vehicles. Listen to how Chargeway is helping to demystify the charging process and reach drivers across Oregon and beyond. The future of climate and energy continues to be an important topic of discussion in the Oregon Legislature. Our agency is watching the evolution of HB 2020, which would establish a new cap and trade program for Oregon, and SB 978, which would create the Oregon Climate Authority. We expect that the Joint Committee on Ways and Means' Natural Resources Subcommittee will take up budget talks for climate and energy work later this spring, but a presentation, which will include public comment, has not yet been scheduled. Your input on the budget for climate and energy work is critical! If you haven't reviewed the Governor's Request Budget for 2019-21, you can find it here on page 137. Visit the subcommittee's website to track meeting schedules and agendas. ODOE staff will participate as requested to talk about our current work and what we see for the next biennium. Earlier this month, several members of the Energy Facility Siting Council and a handful of ODOE staffers toured PGE’s Salem Smart Power Center. Kevin Whitener, PGE’s Senior Controls Engineer, led the tour of the 5-megawatt lithium-ion battery system that opened in 2013. Whitener reported that the plant has helped PGE demonstrate integration of renewables onto the grid, stabilization of grid frequency, and simulation of a microgrid. Governor Brown's office collects and shares interesting news about state agencies' work. This week, the Governor's news site highlights ODOE's interview with the City of Ashland's Climate and Energy Analyst, featured on our podcast Grounded. Check it out! A few weeks ago, our work with other state agencies to help Oregon prepare for an energy emergency was also featured. And we were mentioned in this piece about the multi-agency response to the winter storm that hit Oakridge. ODOE staffer Rob Del Mar participated in a ribbon-cutting last week for a new project being built by Three Sisters Irrigation District. Read more about this interesting approach in Central Oregon. The project has been awarded a Renewable Energy Development Grant. Remember: we're accepting new RED grant applications now! Our Home Energy Performance Score Stakeholder Panel met earlier this month in Portland. On the agenda: working on a statewide scorecard that cities and towns across Oregon can use and customize to help Oregonians better understand energy use and energy efficiency in homes they rent or buy. Meeting information is available on our website. You've seen the Go Electric Oregon website. You've followed Oregon's progress on electric vehicle adoption (21,000 registered EVs and counting!). You've listened to our latest podcast interview with Chargeway (see above!). Now check out how state agencies like ODOE are putting Governor Brown's Electric Vehicle Executive Order into action. We've updated our website to show how we're meeting our objectives and making strides to electrify Oregon's transportation system. Check back regularly for updates and news about future public meetings to discuss various EV-related initiatives. ODOE is also working hard with our state agency partners on a Built Environment Efficiency Working Group, which is charged with implementing Governor Brown's Energy Efficiency Executive Order. The Built Environment Efficiency Working Group will hold a public meeting in Salem on April 16 to discuss our progress. Details here.